From chemicals to chainsaws and thermal risks to cold protection, Paul Williamson gives us the vital information on PPE gloves and the governing EU regulations. Glove personal protective equipment (PPE) products are divided into types dependent upon the intended end use. Each of these types is equivalent to the different levels of protection they provide to the wearer. There are many types of PPE gloves. Those detailed in this article are protective gloves against mechanical use, protective gloves against chemicals and microorganisms, protective gloves against thermal risks from heat and/or flame, welders’ gloves, protection against cold gloves, handheld chainsaw gloves, fire fighters’ gloves, ionising radiation gloves, motorcycle gloves and sports gloves. The testing required for PPE gloves is also dictated by these different types of gloves and their corresponding standards. 1. General requirements for glove design - The glove must give the end user the highest levels of protection and be designed to minimise the time required for putting on and removing. 2. Resistance to water penetration - If required, resistance to water penetration provides an indication of how water resistant the materials used to manufacturer the gloves are. 3. Innocuousness - Innocuousness is the restriction of banned substances which cannot be used in components making up the gloves; for example, chromium VI, azo dyes and pentachlorophenols (PCPs). 4. Cleaning - Cleaning instructions including how to take care of the gloves during their wear life. 5. Electrostatic properties - Electrostatic properties, if required, denote the gloves will provide protection against static shocks, so sensitive electrical components or explosives can be handled reducing the risk of a static discharge. 6. Sizing - Sizing gives minimum dimensions for measuring the glove from the tip of the middle finger to the bottom of the cuff, which then determines the end size of the glove to fit the appropriate hand. 7. Dexterity - Dexterity gives the wearer an indication of tactile feeling through the gloves and indicates increases or decreases of the ability to pick up objects. 8. Water vapour transmission and absorption - If required, water vapour transmission and absorption gives an indication of how well the materials used in the gloves allow the skin to breathe during wear. 9. Marking and information supplied by the manufacturer - These should include details of the levels achieved for the properties tested against for the gloves, including the relevant pictogram from the standard, and should inform the end user of how to take care of the gloves during their working life. This standard can only be used in combination with another standard containing requirements for specific performance of a product in providing protection. Gloves tested to the EN 388:2003 standard are used in industries such as construction or manufacturing. If the end use is known to have contact with rough surfaces, then a high level of abrasion resistance is required. If sharp objects will be handled then a higher level of cut and puncture resistance will be required. The standard specifies the requirements for gloves to protect the user against mechanical risks and defines the terms to be used. This method is the most common standard which gloves are tested against and contains four tests. For abrasion resistance, tear resistance and puncture resistance, four samples are taken from the palm area of the gloves. For blade cut resistance, two samples are taken on the bias from the palm area. Once tested, the results are compared to the levels detailed within EN 388. At the point at which failure occurs, the preceding level is assigned to the gloves. 1. Abrasion resistance - There are four levels of abrasion resistance, each denoted by the number of cycles achieved. The requirements are 100, 500, 2,000 and 8,000 cycles. They are tested using 100 grit glass paper until the sample develops a hole. The test is then finished and the relevant level assigned. 2. Blade cut resistance - There are five levels of blade cut resistance. 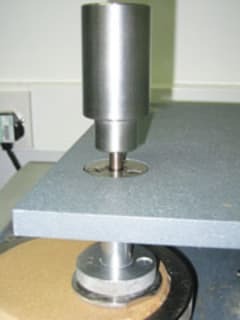 The sample has a steel blade rolled over it using standardised, calibrated equipment until it cuts through the sample. The number of cycles achieved is put through an equation given by the standard and a cut index is assigned. 3. Tear resistance - A trouser tear test is performed in both directions, cuff to finger and across the palm, using a tensiometer. The lowest load achieved is reported. 4. Puncture resistance - A standard pin is mounted on the tensiometer and the sample is securely fastened in a clamp. The pin is driven through the sample and the highest result recorded; however, the lowest of the four results is reported. A level 1 or above on at least one of the four tests is required when a glove is tested against EN 388. See table ‘Levels of protection for EN 388’. The level of the gloves’ protection will be determined by these test results and must be labelled accordingly. These types of gloves are used in industries where oils, grease, chemicals and pharmaceutical biology are conducted, such as in laboratories, oil and gas and engineering. This standard specifies the requirements for gloves to protect the user against chemicals and/or microorganisms and defines the terms to be used. The standard has three parts. Part three specifies the determination of the resistance of protective glove materials to permeation, by potentially hazardous non-gaseous chemicals in the condition of continuous contact. A glove shall be tested using a minimum of three chemicals listed in EN 374-1 and reach at least level 2. The EN 407:2004 standard specifies requirements, test methods, information to be supplied to end users and marking for protective gloves against heat and/or flame. 1. Fire - Burning behaviour is assessed by placing a flame at the tip on the middle finger of a glove. After a given time, the after flame and after glow times are measured and recorded. 2. Contact heat - Samples from the glove are placed in contact with a cylinder at a specified temperature. To meet the performance level the temperature on the inside of the glove cannot rise more than 10°C. 3. Convective heat - Samples from the glove are place over a flame. The time is measured and noted when the temperature on the inside of the glove has risen by 24°C. 4. Radiant heat - Samples from the glove are exposed to a source of radiant heat and the time taken for the temperature on the inside of the glove to rise by 24°C is measured. 5. Small splashes of molten metal - A steel rod is heated until it melts and the molten droplets are allowed to fall onto the glove sample. The number of drops required to raise the temperature on the inside of the glove by 40°C is recorded. 6. Resistance to large splashes of molten metal - Different quantities of molten iron are poured onto the sample, which has a PVC film mounted behind the sample. This film must not show any changes to the surface (such as discrete spots or damage) when the sample is exposed to the quantity of molten iron specified. The defined performance level for each test depends upon the intended field of application of the glove. Only the tests that are relevant to the risks in the intended end use application need to be carried out. The level of the gloves’ protection will be determined by the test results obtained and must be labelled accordingly. The performance levels for each test range from one to four and the higher the figure, the increased level of performance of the gloves. The EN 12477:2001 standard specifies requirements, test methods, information to be supplied to the end user and markings for protective gloves against welding. There are two types of glove specified in the standard: Type A and Type B. Type A gloves are associated predominantly with gas welding with a blow torch and have higher performance requirements but a lower dexterity requirement. Type B gloves are associated more frequently with TIG (tungsten inert gas) welding and have lower performance requirements but better dexterity requirements. Since June 1995, products designed to protect the user from health and safety hazards must be CE marked before they can be sold in the European Community, or EC. Such products are covered by the Personal Protective Equipment Directive 89/686/EEC. This EC Directive defines the regulations and procedures required before a PPE product may be CE marked and placed on the market. It includes a set of health and safety requirements with which all PPE must comply. The responsibility for ensuring that the Directive is adhered to falls upon the manufacturer. The Directive is enforced in the UK by the local authority Trading Standards Service. Failure to comply can lead to up to three months in prison and/or a fine of up to £5,000. Furthermore, manufacturers can be required to recall and replace any equipment found to be faulty. The CE mark is the manufacturer’s claim that their product meets the requirements of the Directive. It is illegal to CE mark a product which does not comply with these requirements. The CE marking process is different for each category. For all categories, conformance with the requirements of the Directive must be declared in writing, and a technical file must be compiled. For intermediate and complex design products, an independent assessment of the product is also necessary. This process is called an EC Type Examination, and usually involves testing against a harmonised European standard in order to prove conformance with the requirements of the Directive. For complex design products only, there is a further requirement that production is independently monitored to ensure that quality levels are maintained after the CE marking license had been granted. This is achieved through regular factory inspections, or approval of a recognised quality control system, by competent authorities. The vast majority of glove PPE falls into the intermediate design category; however, there are some exceptions. Gloves for use in dangerous situations, such as when fire fighting, would normally fall into the complex design category. Following successful completion of the relevant testing programme, a technical file must be compiled and assessed by a Notified Body appointed by the government of an EC member state. The Notified Body has the authority to issue an EC Type Examination Certificate, which is effectively a license to CE mark the product. The technical file is held by the Notified Body for at least ten years after the last placement of the product on the market. Upon successful assessment of the technical file, a document called an EC Declaration of Conformity must be submitted to the Notified Body. This is a legally binding document which states that the product is in conformance with the PPE Directive. Changes to the product are not permitted without further testing and recertification. Manufacturers located outside the EC must have an authorised representative established within the EC. As well as the CE mark, various other markings must be present on the gloves, as defined by the relevant harmonised standard. An information notice to the user must be supplied with each pair of gloves sold. This is a document which explains the protection provided and other details such as care guidelines. Products for which certificates are granted may be CE marked and sold freely throughout the European Community; however, the latest draft version of the PPE Directive states that certificates are now only valid for five years. This is expected to be made permanent when the final draft of the Directive is issued.